A dear friend of mine shared the same interest so we decided to just join forces and put together the best swap Tulsa had seen. We planned to do a fall swap. (I recommend planning with the season change because that's always a good time for people to clean out their closets). The date we chose was Wednesday October 5th 2011 from 7pm -10pm. We needed a name so after researching we loved Be Good. 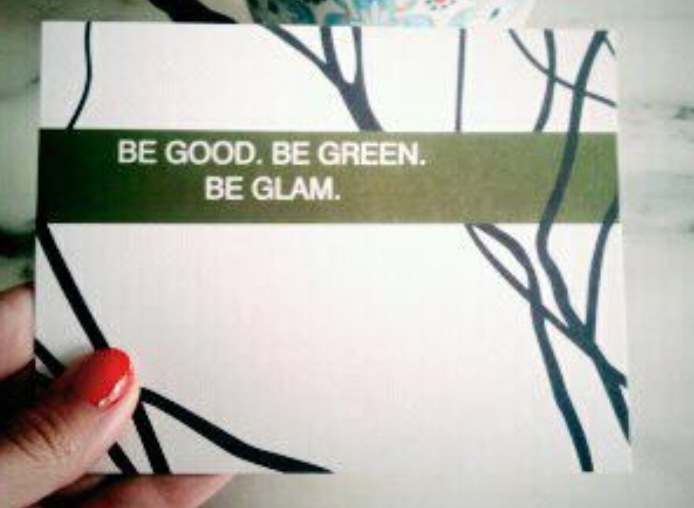 Be Green. Be Glam. We secured a location in my building lobby area. We knew we needed space and since this was also a charitable event we also knew we could not invest money in a space. (I recommend pooling your resources and seeing what space you can get for no cost). Luckily I live in a building where we can reserve the lobby space for these type of affairs. We also reached out to several charities in our area that would pick up all of the leftover clothing. After interviewing several we agreed DVIS (domestic violence intervention services) was the organization we wanted to partner with. These are the top four things you will want nailed down before communicating your event to the public. Once those key components were concrete we were able to get a save the date out and we chose facebook as our platform to do that. "Save the date ladies!! Get ready for a fabulous fall fashion swap. Relax, mingle, sip, and SWAP clothes, shoes, and accessories you no longer need or wear. Relish new-to -you items and help a local charity. We are pleased that our chosen charity is DVIS. Formal invites with all the details will be coming your way. Please send your mailing address to (provide email address) and I will need them by September 1st. This event is invitation only"
The emails were flooding in left and right. In the meantime we booked news interviews and newspaper interviews to help promote the event. We also designed our formal invitations through Vista Print and got those ordered. We worked on our catering and beverage menu and shopping lists. And also worked on our clothing rack budgets and supplies needed. (utilize things you have around the house first. Get a new bakery to donate some sweet treats to get them such exposure, see if your friends can donate a dish to your event, ask your local dry cleaners if you can borrow hangers...we did all of these things and it helped greatly. We found a ton of stuff throughout our homes too..various suitcases, dishes, vases...we even create a great vintage bulletin board with old postcards we found at the Tulsa flea market. We were frustrated with how swaps had previously worked where someone always brought more then what they left with. And that really there were just no rules or regulations in place to make the event enjoyable. We brainstormed for days and came up with the perfect most fair plan of action. In our formal invitations we let guests know they needed to drop off their swap items to the salon my friend worked at with a cut off date. ( we did two weeks prior. If I ever did it again I would do three weeks) My friend picked up the salon items every other day and brought them to me where i could curate the swap pieces, steam them and tag them ! Anything we could not use was immediately donated to DVIS. The formal invitation also stated that when they checked in to the event they then would be given their envelope with tickets to redeem on new merch. This would keep things fair and organized) Our formal invitations also let guest know they would need to bring a ten dollar donation ! This helped cover some of our left over expenses with the racks , food, and alcohol ! We developed a pricing system. Ex. Pants: 4 tickets. Accessories. 1 ticket. Shoes. 2 tickets and so on. We then purchased raffle tickets and put them in envelopes with the clients name on it so they felt incredibly special when entering the event. We just used a stamp for the front to add some glam ! We got a ton of support from friends who were willing to help behind the scenes with set up , tear down,food prep, door guys, a photographer, and people to run the check out portion of the evening. Thank goodness for good friends ! The night was such a huge success !!!!! Everyone had a wonderful time and were very pleased with their new to them items !! And DVIS was soooo happy with the 6 car loads of clothing for their organization. It was a win win and is still remembered to this day !! Highly recommend you doing one in your area ! If you have any questions I would love to help .